The Internet has done us a great favor. It gave us the possibility to inform ourselves. We no longer have to stare at an all knowing screen that dictates what’s true in the world… or get lead poisoning from reading the papers. Instead, we are now surfing the information sea, making connections and drawing our own conclusions… right? Well even if today’s man is a thoroughly informed one, he might wake up one morning and realize that he actually misses being a couch potato. Sitting comfortably, having snacks nearby and being spoon-fed by the media is a fairly relaxing way to spend time. But if the rest of the world is moving on fast forward, how could you indulge in these decadent pleasures? Have no fear, Opera comes to your rescue riding on a tablet! 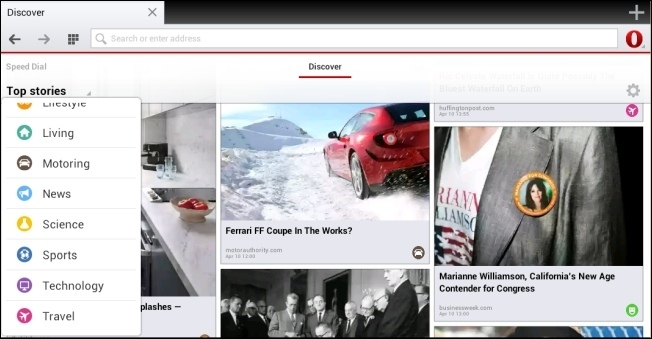 If Opera Mini is a good browser for the fast lane, Opera for Android is the better choice if you’re holding a tablet. It may not look so special at first glance but once you tap the ”O” button you’ll suddenly be more appreciative of Opera Mini’s big brother. Evoking high adventure, the Off-Road mode is the switch that blends Opera’s higher tier interface with the velocity of Opera Mini. Activating it will instruct the browser to load only so much of a website’s graphical elements so that it will maintain its general aspect. This can save you up to around 90% of the data traffic and provide an increased page load speed. Isn't this great? 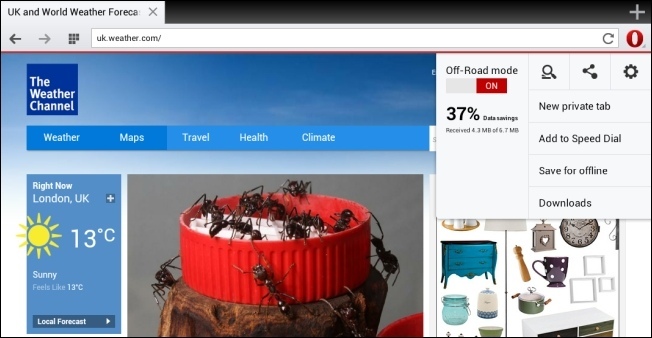 In addition to that, Opera for Android comes with a number of very handy perks. For example, searching in the address bar through specific domains such as Google, Wikipedia or Amazon. There’s also private browsing, yes. Now you can keep your financial operations and other… sensitive activities away from prying eyes. The Speed Dial is a bit rustier than the one in Mini. You can only add a link after you have actually visited it. But on the flip side links can be organized into folders just by dragging one over another. In case you forgot the claim I made in the paragraphs above, then I politely remind you that Opera for Android is the return to innocence, or rather a good way to take a news bath. While the Speed Dial is in view, you can swap left for a history recap, or right for a multi-categorized news extravaganza. The Discover screen is a constant feed of news of every mainstream aspect you can think of (except some). You can select a specific topic like Travel or you can read them all mixed up in Top Stories. The feed is updated regularly and has enough articles to entertain you for hours. Firefox Share and Opera link are still there, so if you love sharing between devices you won’t be disappointed. A weird thing about it though is that you cannot save bookmarks anywhere. It simply does not have one of the most common features of a browser. They probably forgot to add it, that’s understandable. Or maybe they thought the Speed Dial is a proper replacement but that sounds too farfetched to me. Anyway, if you have the habit of stoking up bookmarks for the coming apocalypse then you’ll probably want to avoid this one. Then again, if you constantly browse in private there’s no need for them, is there? Anyway, if you are thinking of upgrading from an earlier version of Opera, then your bookmarks will still be there, ready to be converted to speed dial tiles, under a folder called Legacy Bookmarks. Oh, wow! Opera for Android is a great mobile browser, at least for casual users or those that want to avoid data connection abuses (who doesn't?). Not only thanks to the Off-Road option, but also because of all the other nice features it has I've already mentioned above.